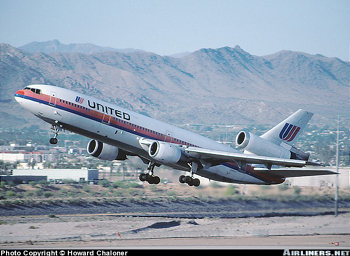 United Airlines (UAL) Flight 232, a McDonnell Douglas DC-10-10, was a scheduled passenger flight from Stapleton International Airport in Denver, Colorado to Philadelphia, Pennsylvania, with an en route stop in Chicago, Illinois. On July 19, 1989, at 14:09 Central Daylight Time (CDT), Flight 232 departed Denver with 285 passengers and 11 crewmembers on board. About 1 hour and 7 minutes after takeoff (at approximately 15:16 CDT) the flight crew heard a loud bang followed by vibration and shuddering of the airframe. The flight crew checked the engine instruments and determined that the No. 2 engine (tail-mounted) had failed, and they initiated the engine shutdown checklist. While performing the shutdown checklist, the flight crew noted that the aircraft's normal system hydraulic pressure and quantity gauges indicated zero. The No. 2 engine failure had been caused by a catastrophic uncontained fan disk burst that resulted in engine debris damaging the aircraft's three hydraulic systems that were located in the tail section of the aircraft. The airplane was minimally controllable via the use of asymmetric thrust control. The crew managed to maneuver the airplane to the vicinity of Sioux City, Iowa. At 16:00 CDT, after being cleared to land at Sioux Gateway Airport in Sioux City, Iowa, the airplane experienced a crash landing while attempting to land on runway 22. There were 111 fatalities, 47 serious, and 125 minor injuries from this accident.